- From all nominations, up to 45 National Semi-Finalists will be selected (up to 9 per category). - From all Semi-Finalists, a group of 15 National Finalists will be selected (3 per category). - From the 15 National Finalists, the 5 “Leaders of the Year” will be announced on-stage at the US Expo. The nominee does not need to possess the formal title or position on their team to be nominated for this award. For instance, someone who has greatly impacted recruitment and leadership development could be nominated as a Membership Leader. Executive Leader: has significantly impacted the overall sustainability, strategy, culture, and development of members and projects. While this is typically the President, anyone on the team could qualify based on their impact on the team. Membership Leader: has significantly impacted one or more of the areas of recruitment, engagement, leadership development, team succession, and culture building. While this is typically a VP of Membership, VP of HR, or VP of Engagement, anyone on the team could qualify based on their outcomes. Project Leader: has significantly impacted a specific project or a portfolio of projects (i.e. by managing a team of project leaders). While this would typically be a Project Manager or VP of Projects, anyone on the team can qualify based on their impacts. Marketing Leader: has significantly impacted one or more of the following areas: internal or external communications, social media, graphic design, advertising, script writing, annual report design, audio-visual design. While this would typically be a VP of Marketing or Secretary, anyone on the team can qualify based on their outcomes. Finance Leader: has significantly impacted one or more of the following areas: fundraising, budget management, income generation, institutional financial support. While this would typically be a VP of Finance or Treasurer, anyone on the team can qualify based on their impacts. Leaders of the Year will receive priority seating at US Expo events, and presentation of your framed “Leader of the Year” certificate on-stage at the Opening Ceremonies at the US Expo. National Finalists will receive priority seating at US Expo events, a National Finalist Certificate, and group recognition during the Opening Ceremonies at the US Expo. National Semi-Finalists will receive priority seating at US Expo events, and group recognition during the Opening Ceremonies at the US Expo. All finalists will have earned powerful recognition as an engaged leader. 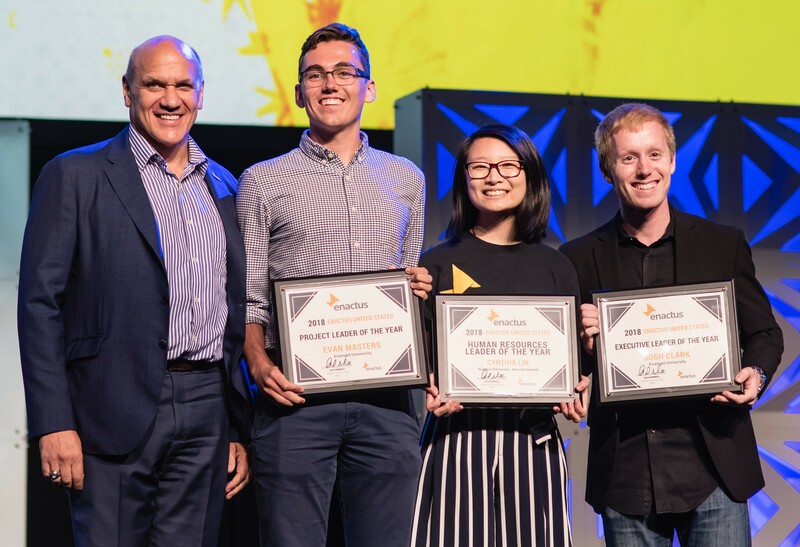 - Nominees must be an active Enactus student and currently enrolled in classes or enrolled in classes during the 2018-19 academic year. - You may nominate numerous individuals, but you must submit a separate nomination for each nominee. - Enactus will only evaluate one nomination per nominee per category. We advise that you coordinate within your team to submit one main submission. You may, for example, have a student leader submit the nomination which contains a letter of recommendation from your advisor. - An individual may be nominated for no more than two categories; however, a nominee can only advance as a Semi-Finalist within a single category (their highest-ranking category, relative to the other nominations). If a nominee is nominated for more than two categories, Enactus will evaluate the two most recent submissions. - It is advised that you save your responses within a Word or Excel file to check character and word counts as you may lose data within the nomination form. - If you submit multiple nominations for the same person within the same category, we will evaluate the most recent submission. - Judging will be based upon the survey nomination responses and the quality and clarity of the examples given. As within all Enactus competitions, your ability to effectively provide context while communicating quantitative outcomes will improve your position. - Enactus staff may reference all sources of internal data, and may check references (advisors, etc.) to ensure what is reported is accurate.